While wearable clothing is the bread and butter on which the fashion industry runs, I love it when conceptual, artistic work makes its way onto the runway. Last night it was front and centre in a show by independent clothing designer, Jánosi Matild of TildArt. "Growing tired of seeing today’s fashion as a series of trends followed by the masses, Matild aspires to bring out the individuality of a person in her designs while adding her own personal flare and embellishment..." and she loves it when the materials she works with have a history. Why Eco? Matild was born in Transylvania, Romania, where nature is respected and protected. It was natural to embrace the concepts of recycling and protecting the environment. Now living in London, she still spends most of her time split between her home country and Budapest, Hungary. The first material she ever worked with was a vinyl record. It was baked in the oven to soften and shape it into the very first TildArt bra! Now discarded, recycled and donated materials from bicycle tubes to old vinyl records provide the starting points as well as the texture. They are sourced from bicycle shops, labs, removal companies and second hand shops and are given a second life. Often the final designs grow organically from the materials that she weaves together "like a magician." I am sure her fine arts degree comes into play here. The next step was to embrace Eco-marketing by choosing to advertise the label and events on the back of zero emission rickshaws ferrying passengers around fashion centres such as London, Paris, Milan and Rome. Last night was billed as a showcase of her BICYCLE collection, but in the end we saw 2 unique shows. The first featured garments fashioned from recycled bicycle inner tubes collected by a London rickshaw company called Bugbugs. 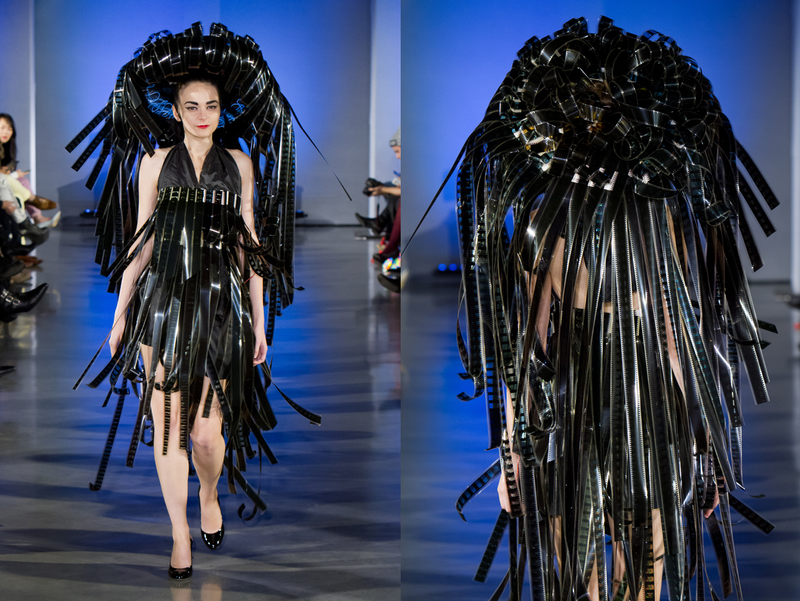 They now collaborate with her by collecting bicycle tubes that have traveled 1000's of miles which she re-purposes into edgy, fantastic garments. Loved the styling and accent colours featured in this segment. Carrying the orange over into the eye make-up was brilliant as was the decision to have models carry bicycle parts on the runway. Next came a series of garments that were accented with miles and miles of old style film. It was hard to be sure, but it did look like some was exposed. In a brief chat with the designer after the show, she confirmed what was obvious - the curving, sweeping, bouncing film accents were not added to the undergarments until after arrival in Vancouver. Again, the audience was spellbound by both the unique designs and movement of the film embellishment. The final look actually offered lighted accents shown off when the runway dimmed in a closing pose. From styling to presentation to music, everyone came to attention in their seats the moment the first model hit the runway and didn't relax until the designer had taken her final bow. When the lights came on, and the models did their last walk to usher in, the applause was unanimous. After watching such an out-of-the-box show, it was no surprise to read one of her style icons is Lady Gaga. "She is a style icon who is not afraid to break from “traditional style”. She embodies the new style of “secular fashion”, who is unique and extravagant, while being bold and going beyond all boundaries and beliefs. She continually re-invests herself." Hands down, this show was hit and I can only hope I get to be in the audience for a future show by the very talented Jánosi Matild!